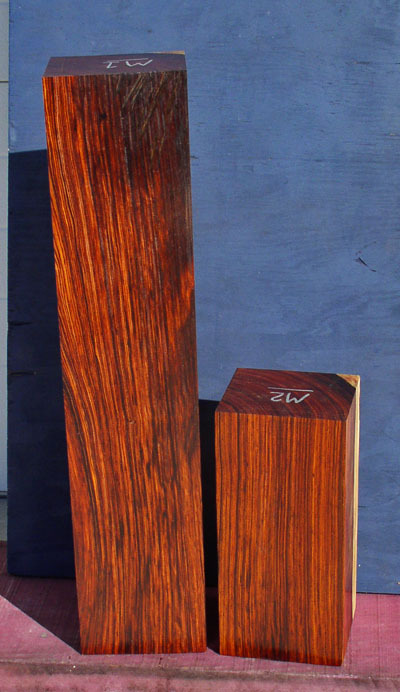 Some people consider cocobolo to be the classic rosewood. It comes in many shades and colors. It is a rosewood that usually has a fair amount of natural oil in the wood. Sapwood is cream colored. 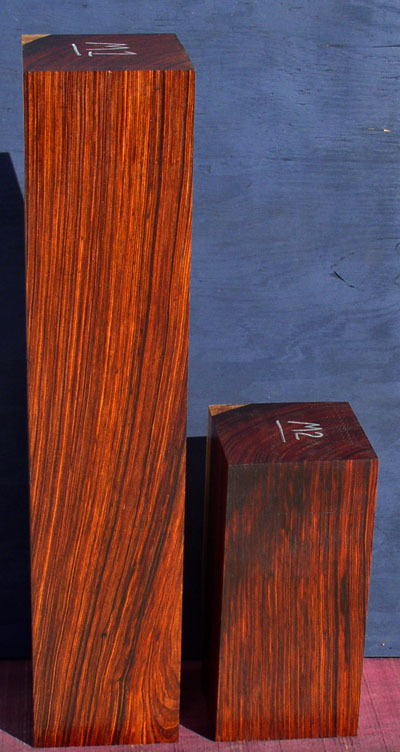 The picture above represents the look of a lightly figured piece of Mexican cocobolo. 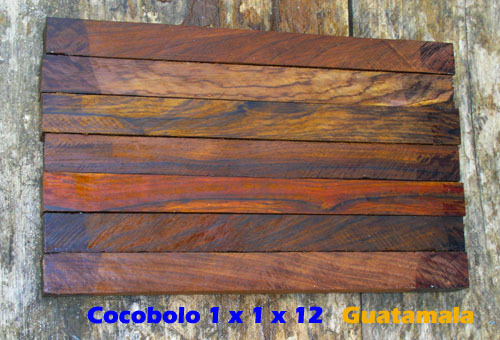 Mexican cocobolo can also have more or less orange or brown, straight or wavy lines, many lines or few lines. Each piece varies a lot. 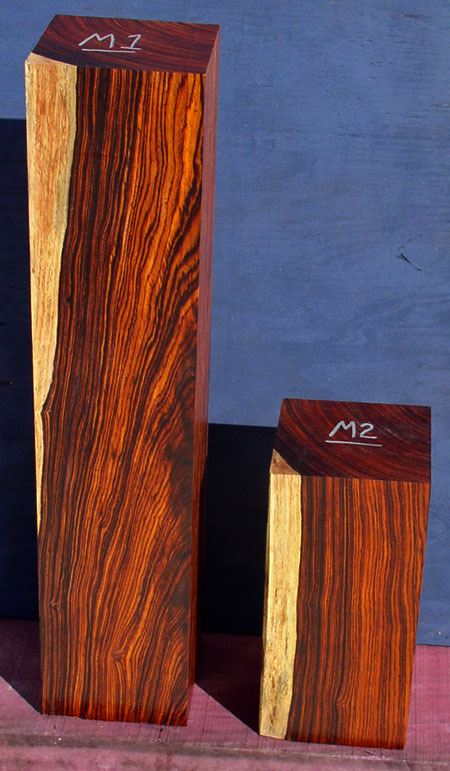 We also sell cocobolo from Nicaragua or Honduras, which generally has less bold look to the lines, but the color is more orange, and the wood may have purple colors inside when you cut into which will turn bright orange after a short time. Some people prefer one type or the other. Sometimes you can't tell which country it came from by looking at it. We have now developed a system of marking each piece to help you get an idea of the country that piece comes from, which can be considered a general guide to appearance. High demand for this wood from China has caused the price on the wholesale level to more than double in last couple years and has also lead to restrictions: Restricted as of June 2013, CANNOT BE SHIPPED OUTSIDE THE USA. As of 2018, almost none of this wood is coming in the country. No imports at all from Mexico that we are aware of. Mostly from Guatamala only, but then very little. New: pieces are color coded by country to make it easier to see where the piece comes from! Note: Color of photographed pieces may deepen by the time they are sent to you. We have represented colors as accurately as possible! Some of the actual pieces for sale, lots of different colors. Prices are based on random pull of color. If you need specific color, contact us, there might be an extra charge depending on what you need. Supplies are very limited and VERY hard to get. Click the photo for the other side. These Large and flawless pieces are the last we have of the old growth very high density cocobolo that comes from the Yucatan part of Mexico. 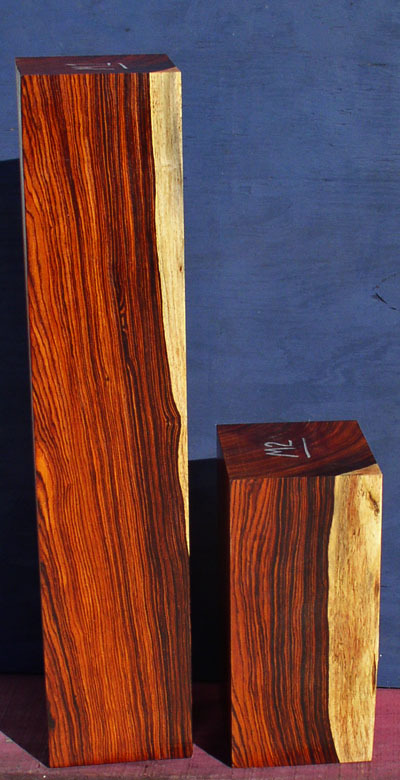 Due to dried conditions, the Yucatan cocobolo is more dense and grows slower. This type of cocobolo is nearly gone from the market, and it is anyone's guess if it will ever be allowed to be exported from Mexico again. Very rare now. These piece have dried a number of years and are dried through despite the huge sizes. Pieces missing below are sold. Not legal for export from USA!